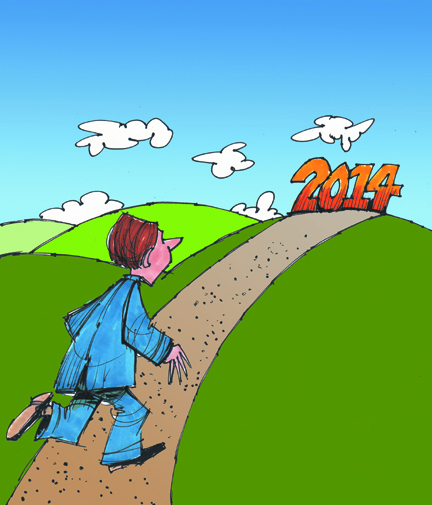 As I reflect upon 2013 and look forward to 2014, I think of the watershed events that occurred this past year and what impact they will have on the future of business and financial services. I’ve seen an ebb and flow of the responsibilities of financial executives and the role they play and see great opportunities locally, nationally and globally in the coming year. A December 20, 2013 release from the US Bureau of Economic Analysis reports that the US economy grew 3.6% in the third quarter. At the same time I see recent surveys of consumer sentiment that suggest that a majority of the populace views the economy as stagnant. Experience suggests consumer sentiment to be a lagging indicator of economic activity thus these numbers seem in sync. Consumers tend to be leary of the economy despite economic statistics signaling that the economy is trending upward. A Grant Thornton survey of CFOs conducted twice a year revealed in its fall 2013 results that roughly 60% of executives view the economy as remaining the same or worsening. A third quarter 2013 Business & Industry Economic Outlook Survey by the American Institute of CPAs, however, suggests that 34% of financial executives say they have too few employees and 15% plan to hire. In the Bay Area we are fortunate that the technology industry continues to be strong. It reflects in the labor market especially as the area leads the nation in direct hire or permanent placement of financial professionals. Some financial skill sets are in especially high demand and the competition for skilled individuals among businesses is intense. Despite the economic uncertainty business executives have to make resource allocation decisions in their industries and none is so critical as that of hiring. I suspect that executives and business owners who make bold hiring decisions are the most likely to succeed in the current environment. This involves taking a risk, of course and many would argue that restraint in hiring is the more prudent course. However, success often belongs to those with the vision to see a path to success and the courage to act upon it. Shifting tax policy and the resultant impact it has on capital available for spending and investment casts a shadow over the economic landscape. Business owners and executives as well as individuals are all inclined to hesitate in the face of tax policy changes. It remained a central issue of concern to Congress in 2013. In January 2013 the American Taxpayer Relief Act was passed. While many of the Bush era tax cuts were made permanent, the law brought with it increases for top income producers with the top marginal tax rate increased to 39%. Finally, the new 3.8% Medicare tax on investment income became effective further increasing the rate of tax on top earners. This is yet another tax withholding issue that businesses have to be attentive to or face penalties for failure to comply. Financial executives continue to view the administrative burden of regulatory requirements and compliance with new rules as a chief concern. A recent BDO survey shows that 69% of board members at midsize companies consider regulatory requirements and compliance with them to be a top risk to business. This continues to represent a burden of more work and expense for businesses as they must comply with new rules and yet this expense adds nothing to revenues. Economic uncertainty continues to pervade the business landscape. For years now we’ve seen businesses increasingly turn to outsource or interim solutions to enable them to minimize costs while still enabling them to grow and expand the business while maintaining their regulatory and administrative responsibilities. Often financial skills, especially those not viewed as “core” to the business, are not needed on a permanent basis. With no apparent strong uptrend in permanent hiring in the offing it appears that consultants will continue to play a key role for specific, high value, high return projects at client companies in order to fill in for missing skills that businesses need in order to be productive. CFOs are most likely to outsource projects where key skill sets are likely to yield cost effective results of significant benefit to their businesses.